Sliced ham can be bought at the local supermarket but if you do not have it ready, Spam or Luncheon meat chopped into cubes or strips will also do nicely. If you have other vegetables on hand, add it in as well. I especially love cauliflower (which we did not have at the time of cooking). We also added in some sweet peas fresh from the garden. And while you do not add water to this recipe, you will be surprised at the amount of water mushrooms hold, with the dish ending up with a bit of water in it. And for that distinctive, slightly sweet taste, we add hoisin sauce. 1 medium head of broccoli, florets separated into small, munch size pieces. The stem can also be eaten. Just remove the tough outer skin, then slice. Heat up oil over medium heat in a deep frying pan/wok. Saute onion and garlic. 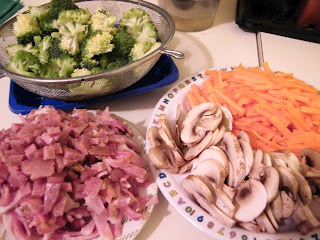 Add in the ham, followed by the carrots. After a couple of minutes, add the broccoli and the mushrooms. Cover for a couple more minutes or until broccoli is tender. Add the hoisin sauce and mix. Add salt and pepper to taste. 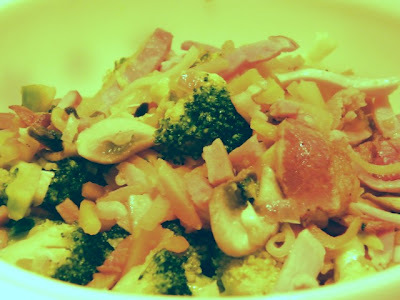 A great and simple recipe :D Thanks for sharing!